« Stress Relief is a Weekend Away! Sharing our 6 Key Bloody Mary Bar Ingredients is our pleasure as we prepare for our new Virgin Mary Breakfast bar debut at The Captain’s Manor Inn on Mother’s Day Weekend 2016 right here in Cape Cod. The Robinson family has long been a fan of a good Virgin or Bloody Mary and we are often known to enjoy one in the comfort of our living room while watching a football game and enjoying potato chips and homemade onion dip or if we are being a little healthier the snack might be tortilla chips and salsa or even raw vegetables and ranch dip. We are always in search of a really good mix and of course the right condiments. In our travels we have experienced a host of different condiments and mix blends. In fact, I think Kevin may have a little Canadian heritage because he is known to like to add Clamato juice along with tomato juice when making his drink and in Canada that is a fan favorite known as a Caesar rather than a Bloody Mary. With a special blend of ingredients and our list of key ingredients we are happy to begin offering a Virgin Mary bar for our guests during Saturday and Sunday breakfast. 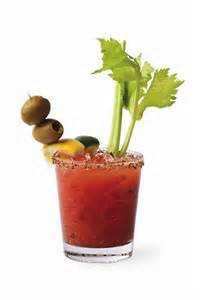 It goes without saying that you need to start with a good tomato juice for your base and we use Sacramento tomato juice. 1). Salt or Old Bay Seasoning – You need to start by preparing the rim of your glass by first putting some lime juice or lemon juice on the rim then dip the glass rim in either some nice kosher salt or Old Bay Seasoning. 2). Citrus – You have already used a little lemon or lime juice on the rim of your glass and now a couple wedges of lemon or lime will add a little zing to your drink. 3). Veggies – A nice crisp celery stalk for both stirring and munching is a key ingredient. 4). Garnish – Some large queen olives stuffed with pimentos and some petite pearl onions add a nice pop your drink after they have been soaking in the mix for a bit. 5). “Magic Mud” – Recently we found a mix that was created by some expert bartenders who refined it over the years. This mix includes 14 all natural spices and ingredients and while it may not look appetizing (the word mud is in its name) it is absolutely fabulous. 6). Condiment Finish – Many of you know I joke about Kevin being the condiment king and if you saw our refrigerator you would know it to be true. So for our Virgin Mary breakfast bar condiments we will offer Tobasco sauce Worcestershire sauce, A1 steak sauce and even BBQ sauce as a nod to our southern guests. 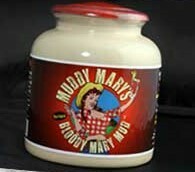 We look forward to your visit and should you want to take home a bit of “magic mud” known as Muddy Mary’s Bloody Mary Mud we have both small and large bottles available in our store.